Updated Resume and all Educational certificates copies, copy of PAN card and Aadhaar card and one recent Pass Port size photograph to the College address are given below and Lab Technicians/Electricians/System Administrators and Programmers are send the resume to College Email Address are given below are given below Before on 19-04-2019. Further Details can refer http://www.smce.ac.in/new/ Official Website. Required details like Salary, Qualification, and Application Procedure are given below. 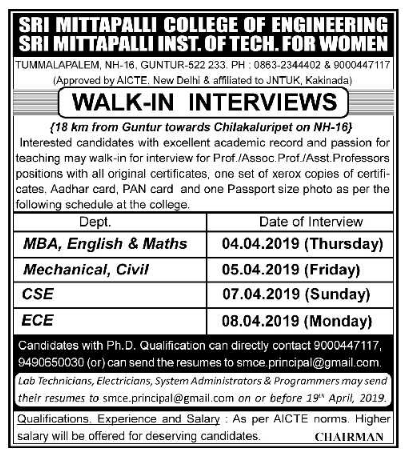 Eligible applicants can attend the walk-in Interview with Updated Resume and all Educational certificates copies, copy of PAN card and Aadhaar card and one recent Pass Port size photograph to the College address are given below and Lab Technicians/Electricians/System Administrators and Programmers are send the resume to College Email Address are given below Before on 19-04-2019.